03.29.14 Texas Here We Come……….! Back in my younger days as a youth at Lakeview Baptist Church we went every summer to a youth camp, usually Glorietta, NM or Ridgecrest, NC. These are two Southern Baptist Assembly Centers where youth, adults, children, senior adults, etc. all have weeks during the summer where we gathered to learn more about the Christian life. They are both set in beautiful areas of our country. Ridgecrest is in the beautiful Blue Ridge Mountains. Glorietta is in a beautiful valley in New Mexico. Oh the memories I have spending time with my friends, Susan, Gi, Kim, September, Gary, our youth leaders Blimp and Ralph! One of the memories that has always stuck in my head is a strong dislike for the State of Texas. During meetings and eating times we’d do cheers and Texas, being the biggest state, always had the largest group there. Their bigger is better mantra just ate at us. I know all of us Lakeview kids remember disliking Texas from those events we went to every year. 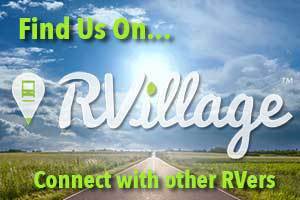 Even if we were in Ridgecrest in NC, Texas was always the largest group! So this long standing aversion to anything Texas is facing a real challenge with us planning to live in Texas for several weeks. I’d like to put that all in the past and leave it there so who knows maybe I’ll leave Texas wearing a 10 gallon hat and telling ya’ll how wonderful Texas was! A girl’s gotta dream! Spending several weeks on a 700 acre ranch near Corpus Christi should soften this Louisiana girl’s heart towards Texas so stay tuned to see what adventures we experience while there! 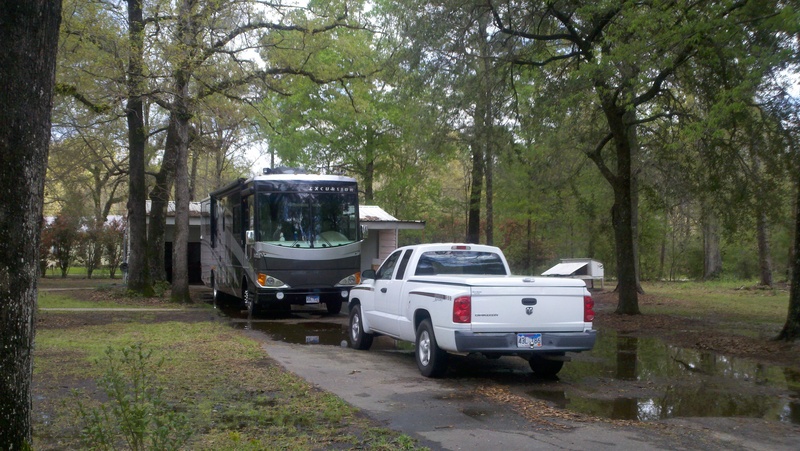 We left Hammond (our hometown) Saturday morning headed for Beaumont, Texas. 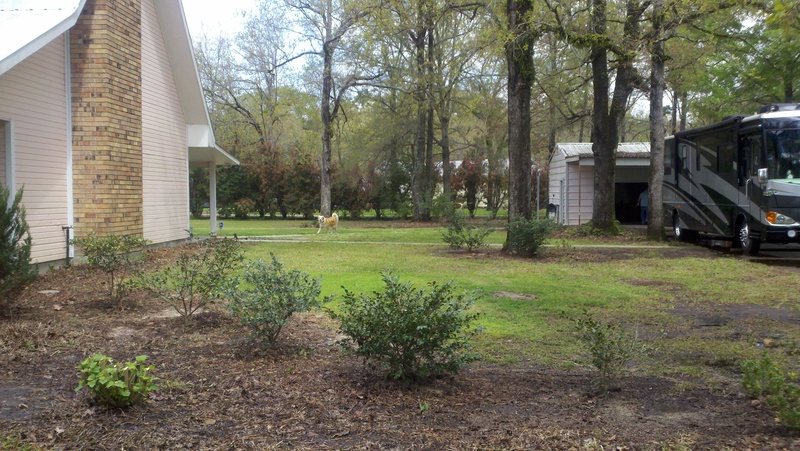 Before we left I took a couple of pictures of our yard work, Dora and Boots sitting in the driveway waiting to go, and our renters dog Dixie. 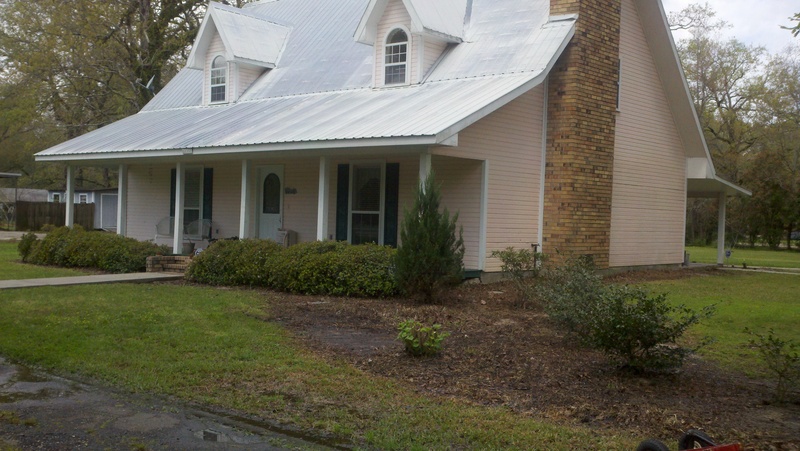 The front gardens that we pretty much gutted and moved many plants all around the yard. That big empty patch fills in with beautiful green vines crawling along the ground full of yellow flowers. All along the side of the house the plants died back in the winter and are all cut down to the ground. They will come back with beautiful multi colored flowered bushes very soon! Yes this is the same scene we started out with a year ago. Dora and Boots living in the driveway! All the bushes you see in the forefront were living somewhere else before the big spring redo. I actually wish we had done this years ago so we could have enjoyed the new look while living there! 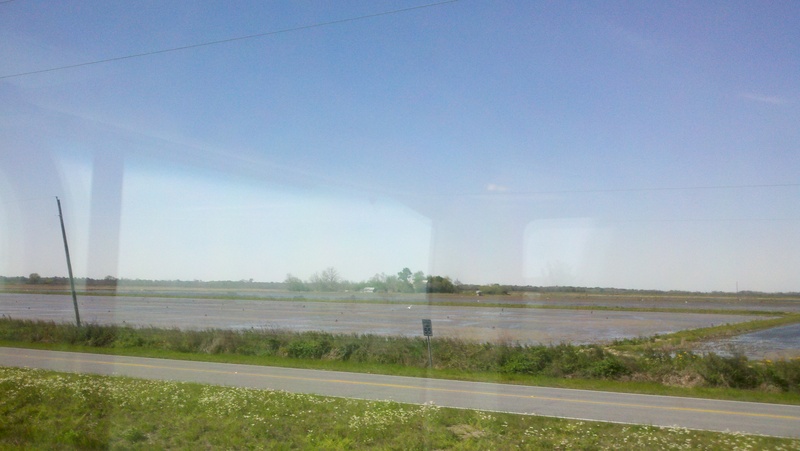 Along the way we drove over the Mississippi River in Baton Rouge. In the picture you’ll see the Louisiana State Capital to the left. 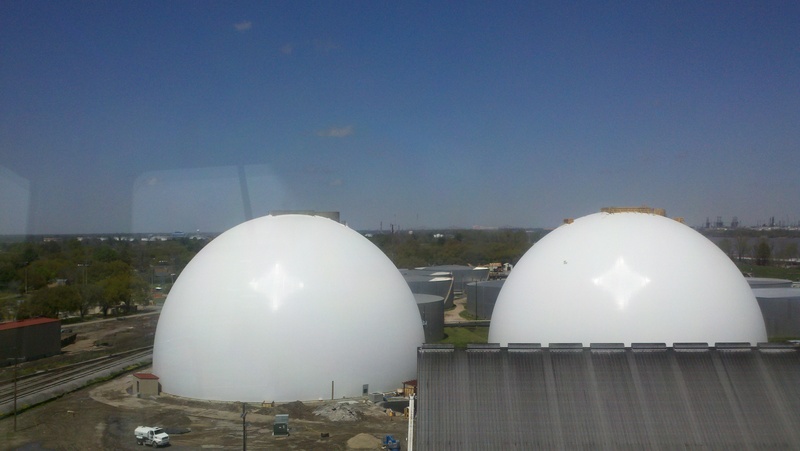 We also passed by two domes which I don’t know what they were, but they looked cool. And finally a whole lot of crawfish ponds. A little bit of Louisiana memories captured before leaving. 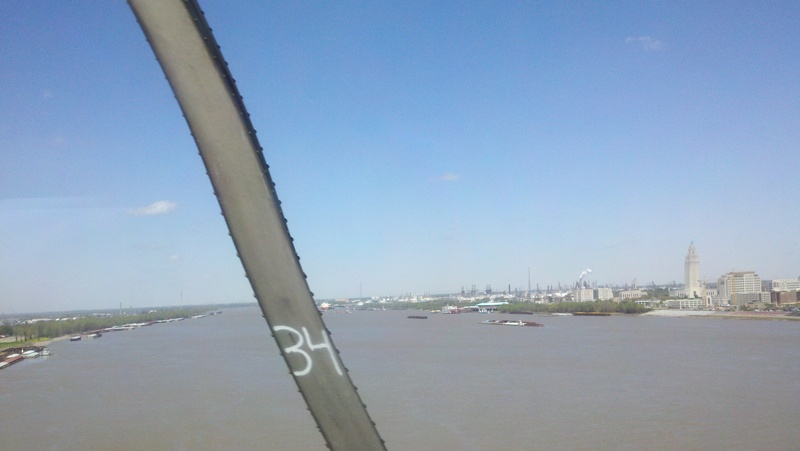 Crossing the Mississippi River in Baton Rouge, Louisiana. State Capitol building is the tall building to the right. Do not know what these buildings are but they were very cool. We saw them as soon as we crossed the river. If anyone knows what they are, please let us know! Crawfish ponds! For non-Louisianians, crawfish are either rasisd in ponds are caught in the spillway. You pay a different price for each type. Spillway crawfish are usually more expensive. Upon arriving in Texas we got our first glimpse at how big they do everything. 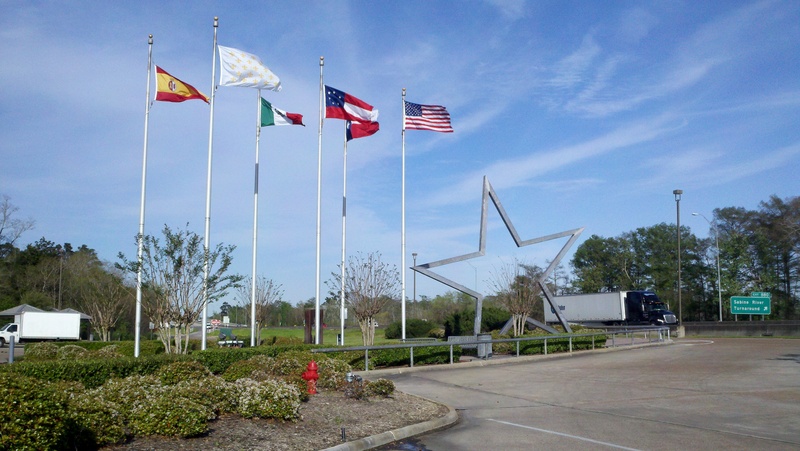 The Texas star that greeted us was massive! Thanks, David Cougle, for the tips on things to look for as we travel through this area. We appreciate all info from everyone as we’ve not traveled through this area in our RV before. Last trip to Texas involved an illegal RV, the local SWAT team and an extreme dose of stress so we’re hoping this trip is more on the fun side! If you haven’t read my post about that adventure check out the October, 2012 Conroe, Texas post! Pictures below are of Dora and Boots (and us) at the Texas Welcome Center. The big Texas star David told us about. This picture just doe snot do justice to it’s size. 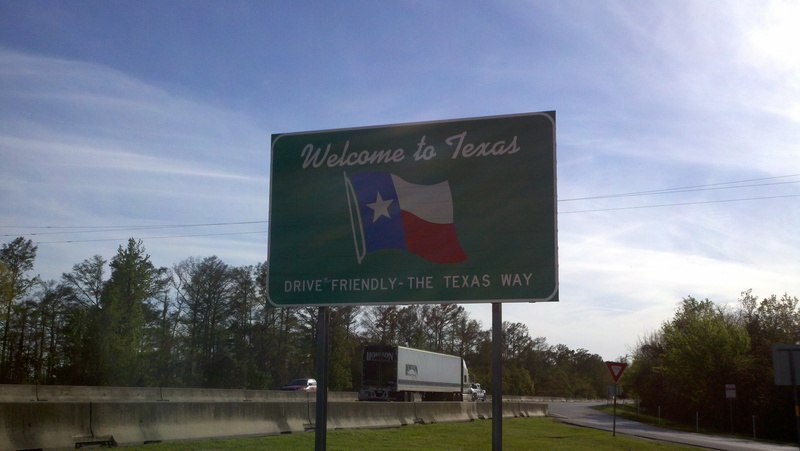 The Great State of Texas Welcomes Us! Dora and Boots being welcomed to Texas! 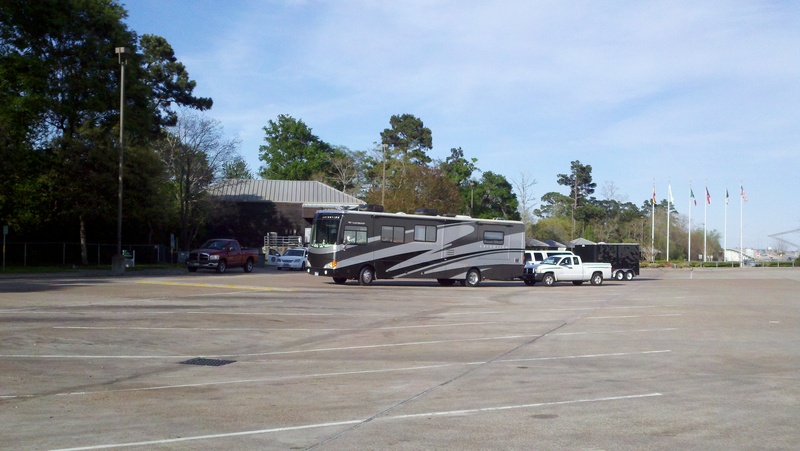 We spent last night in Beaumont, Texas in a Wal-Mart parking lot and are now headed west to somewhere. Don’t know where we’ll stop today but we’re inching closer to San Diego, Texas which is our stopping point for this trip. < 03.28.14 GOD’S NOT DEAD – THE MOVIE! !